Following these air conditioning and heating tips to keep your systems in tip-top shape and performing correctly. A properly maintained air conditioning and heating system saves energy and will help keep your family safe. Heating and cooling systems in disrepair can create a serious safety hazard. Here are some tips to follow to maintain your system. Inspection — Your system should be inspected regularly by a North American Technician Excellence (NATE) certified technician to maintain optimum performance. Your heating unit should be examined twice a year, while your air conditioning system should be inspected at least once per year. Programmable thermostats do save money — Significant energy savings can be realized by setting up your programmable thermostat to your family’s daily life. For example, if everyone’s out of the house during the daytime, then don’t keep the house really warm for the houseplants alone! Set the thermostat to start warming up the house at 5pm, so by the time you all walk in at 6pm the house is warm & inviting. Escaping air is escaping money – Look closely at window seals, doors and vents. If air leaks out, then it’s costing you money on your heating & cooling bill. Most of the time, fixing a door seal or caulking a window is an inexpensive, easy fix and a good investment of your time. Another easy fix is changing the air filters regularly – For an efficient heating & cooling system and healthier air for your family to breath, be sure to check the filters monthly and make regularly scheduled changes at least every quarter. 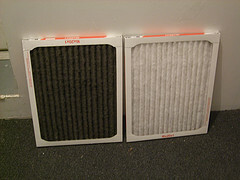 Air filters collect pollen, dust, and bacteria. If the air filter is full the air doesn’t flow as freely through it and then it stresses your air system motor, making it less efficient. Also, all that bacteria and dust can affect your family’s health. Check the outdoor condensing unit – Keep the unit outside clean and free from debris. Keep bushes and grass clippings from the unit and check the coils for built up dirt and debris. You can clean the coils with a vacuum. But be sure to call a professional if deep cleaning is needed. One last word on your furnace—A yearly inspection is recommended prior to turning on your furnace. The combustion area and ventilation system should be checked for dirt and rust. If you see something amiss, get a professional to repair or clean before your turn it on.